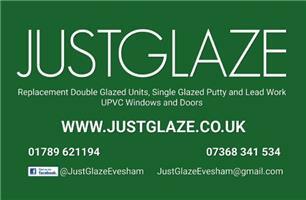 Here at JustGlaze we provide a local, fully qualified complete glazing service. Originally set up in Evesham, we are now based in Bidford-on-Avon which has given us a bigger customer base. We now cover parts of Worcestershire, Warwickshire and Gloucestershire. As Owner and Glazier, myself Alex Swancott I have become passionate about glazing and with the customer service skills I picked up along the way I believe that I can offer a friendly and high standard service to customers.I originally specialised in Glass Replacement which is where I gained my NVQ Qualification but then went onto fit Windows, Doors,mirrors and Splashbacks. I believe in listening to what the customer wants but at also the same time give them my knowledge to make sure they receive a great service.